Megan Fox's Kids: Are Her Sons Wearing Princess Dresses? Megan Fox’s Kids: Are Her Sons Wearing Princess Dresses? Megan Fox is proving to be a mom who’s all about letting her children express themselves, regardless of what gender norms say she should do. One of Fox’s sons was seen wearing poofy dresses on numerous occasions while out with his parents and siblings. Some people have raised their eyebrows at this, but as far as Fox is concerned, all of her sons will grow up with open minds. Find out how many children Megan Fox has, what their names are, and more about them right here. Megan Fox’s kids are so painfully adorable they make you want to have some of your own! Well, they are the kids of one of the hottest celebs around, so it’s easy to see where they got their good looks from! In recent news, Megan Fox posted some pictures of her kids on Instagram, and fans are just eating it up! They are especially loving a picture of her eldest son in a dress. Others have not been supportive of the actresses decision to let her sons choose their own outfits, and have even wondered if Megan Fox has a daughter. Here’s everything you need to know about Megan Fox’s kids in 2017. Megan Fox and Brian Austin Green got married in 2010, and welcomed their first child, Noah Shannon Green, two years later. Noah was born on September 27, 2012, making his age five. He was recently spotted wearing a Frozen-inspired Elsa dress, along with his younger brother, Bodhi, who was wearing a spaghetti-strap dress over a t-shirt in a post Fox shared on Instagram. Megan Fox and Austin Green welcomed baby number two, another son, Bodhi Ransom Green on February 12, 2014 making him three years old now. Green told reporters that he thought of Noah as a sensitive, nurturing, child, and felt he would be an amazing big brother to Bodhi. By the looks of it, Green was right! The boys look like they play well together and his parents could not be happier! Megan Fox and Austin Green, now experts at parenting, welcomed a third baby boy, Journey River Green, on August 4, 2016. The almost one-year-old immediately caught the attention of the media for being so incredibly adorable. Fox posted a selfie with her little one on Instagram, and obviously it went viral. Her sons seem to have inherited her distinctive eyes, and we can only imagine how handsome the three will look when they’re all grown up! 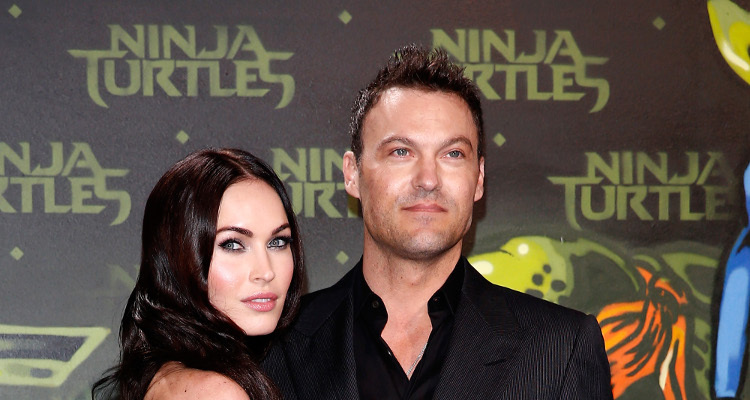 Take a look at more photos of Megan Fox and Brian Austin Green with their sons below. Ünlü yıldız #MeganFox ve #BrianAustinGreen’in Ağustos ayında doğan #JourneyRiverGreen adındaki minik oğluna merhaba deyin. ???? Ünlü çift bebeklerinin fotoğrafını ilk kez paylaştı.